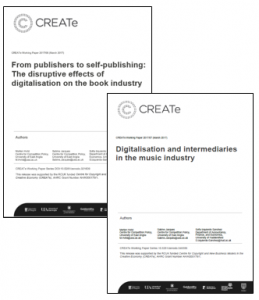 Morten Hviid, University of East Anglia provides a summary of CREATe supported research into the effects of digitalisation on the music and publishing industries. The findings have been published as two new working papers. The two papers explore the structure of the music and publishing industries respectively post-digitalisation. In both cases we observe that digitalisation and disintermediation of support services have made possible an increased potential for the creative agents to self-publish and bypass the traditional publishers and labels. We also observed a move towards a more concentrated retail sector, where the large internet platforms dominate the interface with consumers. We speculate on the effect of these changes on the traditionally powerful firms in these industries, the book and music publishers and the record labels and what the eventual effects may be on artists and consumers. As regards the artists and consumers, in both industries, the main concern today does not appear to be an inadequate amount of creative output being produced; on the contrary more output is available than ever before. The problem has shifted to one of being found, whether it is the artist hoping to be discovered or the consumer hoping to discover new literature or music. While similar trends towards self-publishing, powerful retail platforms and streaming characterise both industries, there are interesting differences in their development to date.